Happy Valentine’s Day!! I hope that you all have plans to spend the day with someone special. This is a card that one of my customers made for her Son’s wedding. 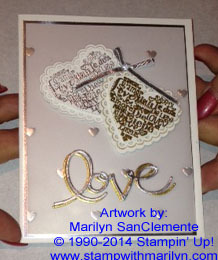 Arlene used the Language of Love stamp set and embossed the hearts in silver and gold. She then layered the hearts onto the lacey heart from the Hearts a Flutter Stamp set. The hearts are mounted onto a piece of the silver vellum from the Occasions catalog. The Love expressions framelit is cut from both silver foil and gold foil card stock and layered together. The hearts are finished off with a piece of the silver ribbon from the Occasions catalog. Enjoy your day! !